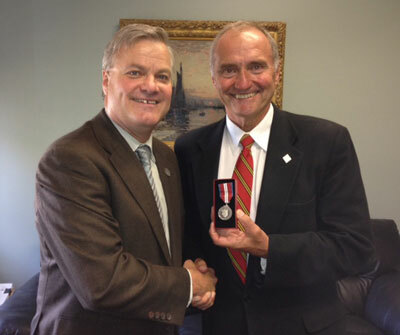 In the fall, Dr. Robert MacKinnon, vice-president UNB Saint John, was honoured to receive a Diamond Jubilee award from Senator Joseph A. Day. The Queen Elizabeth II Diamond Jubilee Medal honours significant contributions and achievements by Canadians. "I am both proud and humbled by receiving this award," says Dr. MacKinnon who was selected for this national award based on numerous contributions to his community. This commemorative medal was created to mark the 2012 celebrations of the 60th anniversary of Her Majesty Queen Elizabeth II's accession to the Throne as Queen of Canada.